WASHINGTON, DC – Thursday was a historic day for American Muslims when both Minnesota’s Ilhan Omar’s hijab and Michigan’s Rashida Tlaib’s thobe stood out in the Congress, showing their identity with pride, MENA FN reported. “Although my parents came from Somalia to this country, I was born and raised here as a Muslim girl and to see a hijabi Muslim woman like me in Congress is a big reflection,” said Kowthar Yabarow, a 24-year-old of Somali heritage who chose to wear the hijab. Tlaib is the first Palestinian American woman to be elected to Congress, representing Michigan’s 13th Congressional District. Omar is also the first Somali-American (and hijab-wearing) Congresswoman in the US. Omar’s journey to become the US first Somali-American Muslim lawmaker began in a refugee camp in Kenya when her family was escaping Somalia’s brutal civil war. 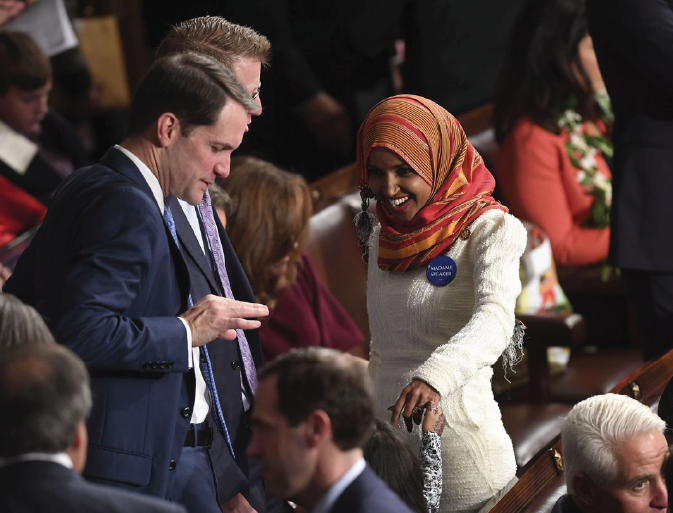 “In Trump era, when anti-immigrant and Muslim rhetoric is high, to witness Ilhan Omar who shares the same values and background with me, sitting in the Capitol Hill and celebrate with her was an amazing moment and inspirational for me,” said Suud Olat, 28, a Somali-American, journalist and a refugee advocate. For many young Muslims, the two Muslim congresswomen meant something special for them. “It is an inspiration and special for me that I can show, finally, to my daughter that, there is a Muslim woman like Ilhan Omar, an immigrant and a woman of color, a Somali, who is able to stand up for Muslim values, share them with the American public through a strong voice in the Congress,” Ibrahim Ismail, a father-of-four, said. “I am so proud to see people with my value like Omar and Tlaib being leaders in this country and I am happy that my daughter will grow up in an era where to have Muslim leaders in the US politics is not news but a normal,” said Tahira Khanana, a 38-year-old mother of three with the Cincinnati chapter of the Council on American-Islamic Relations.